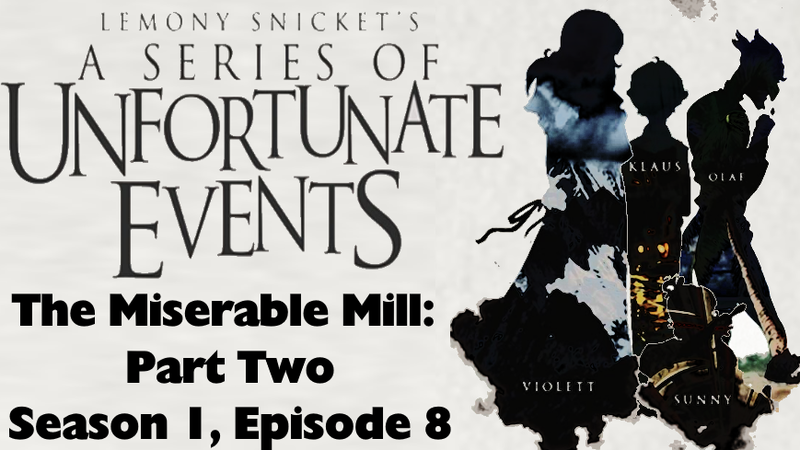 It’s tale full of sorrow and woe, that is quite clear that is how the story goes for we have reached the end of season one of A Series of Unfortunate Events which certainly sets the stage for season two in a big way, but obviously those of you who have read the Lemony Snicket novels would be aware of this. However since I am not familiar with the novels and have been watching the series based on its own merit, I can assure that I am very excited to see the continuing adventures of Violet, Klaus and Sunny Baudelaire to see what happens at this boarding school that Mr. Poe shipped them off too after getting his totally undeserved promotion and following the incidents with have occurred involving Count Olaf. 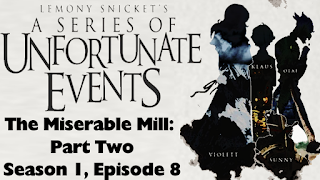 But we are getting ahead of ourselves, let us wrap up our look at The Miserable Mill with part two of the story, which sees that Klaus when he hears the word ‘Lucky’ he turns into an obedient tool for causing fatal or near-fatal accidents at the mill. 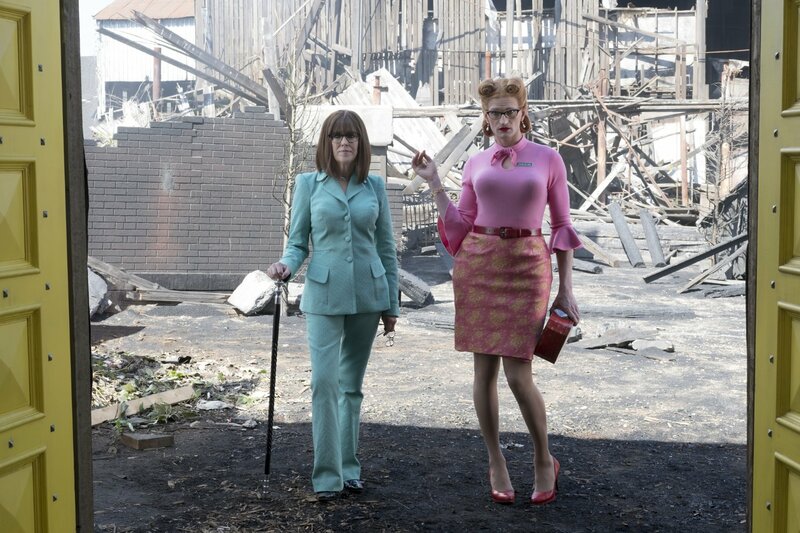 Turns out that Count Olaf’s plan was to first present himself as Shirley St. Ives, a receptionist for Dr. Orwell looking to adopt three children, and I actually like this, as it shows Olaf trying a different tactic, but his plan doesn’t work when Sir, the person running the Lucky Smells Lumber Mill, refuses to let the Baudelaires go into ‘his / her’ care because they are a source of cheap labor (they chew less gum than an adult) and the only way he’d let them leave is they cause accidents, which is why when Klaus is his trace state, he’ll intentionally try to crush a man to death using a stamping machine and be more than happy to work the controls to send a guy tied to a log down towards large buzz saw. Which leads me to the discuss the type of hypnosis use, which is the classic trigger word in order to get the person hypnotized to perform whatever action they were programmed for. It’s possibly the most common of hypnosis seen in fiction and used quite effectively for the most part. Most often however, a story forget to have a trigger word to counter-act the hypnosis, but in the case of this episode that is not the case, and it expands to more than just Klaus, for all the Lucky Smells Limber Mill workers were hypnotized to be ‘happy workers for no pay’ so finding the deprogram phrases plays a big part in the story. But there is the question of why Dr. Orwell would do this, and the reason for it is simply ego and revenge, she knew the Baudelaires parents and they caused her to be banned from her profession as an optometrist, and thus she struck a deal with Sir that if he split the profits of the mill with her, she’ll give him a perfect work force. For all intents and purposes Dr. Orwell had it going good unto Count Olaf re-entered her life, and gradually because of Olaf’s own ego and greed, their alliance falls apart with Olaf turning on Orwell when the deprogrammed Mill workers come looking for answer, ans she ends up accidentally falling backward into the blazing inferno. In comparison to some of the other deaths seen and implied of the cause, Orwell’s death is clearly more a fluke. Then we have the ending which sets the state for the next story called ‘The Austere Academy’, which sees that not only Baudelaires left waiting to meet who I’m assuming is the headmaster, but also two of the three children of the Mother and Farther we’ve been following as side-story as well, turns out that like the Baudelaires, these two kids Isadora and either Duncan or Quigley had their parents murdered in a fire (and I’m assuming which each ever one of the boys that is not at the boarding school as well), and they like Klaus have part of a broken spy glass, thus going back to what I said this episode sets up the next story. Which we will not see for a while, depending on when they are filming the series, and I’m assuming they are going them in short order to keep the young actors involved from aging too much. My overall impression of the season as a whole is that they are indeed staying as true as possible to source material with the number of references and explanations done to make sure everyone is able to follow along, which makes it great family entertainment. The characters are fully likeable unless presented as complete buffoons for no real reason other than the story calls for it. Outside of the Wide Window being a bit uneven, the remaining three stories were really good and as I said before I am excited for season two. With that said, the next Netflix series that I intend to look at will be Marvel’s Iron Fist when they debuts on March 17, 2017 as normally the middle of March means most of the weekly shows I follow should be break prior to April Sweeps, so perfect filler material.